Well unfortunately not ever hike always goes according to plan and for me this was one of those hikes. 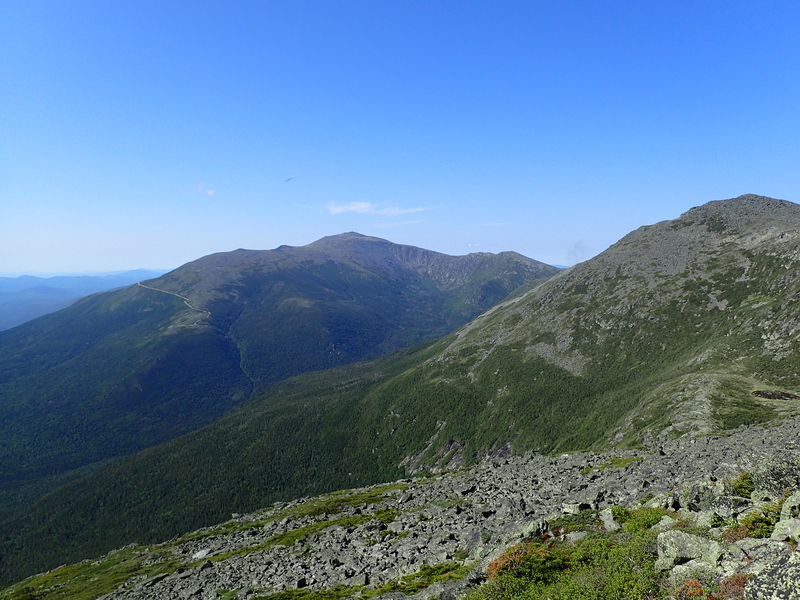 I drove up after work on Friday planning to complete a Presidential Traverse with my buddy Stav on Saturday morning, but poor planning and preparation ultimately did me in. I arrived at the Jackson-Webster trailhead at around midnight Friday night and slept in my truck for about 3 hours before waking up bright and early at 4am to begin our day. We left one car staged at the Jackson-Webster trailhead and after gathering our things headed over to the Appalachia trailhead where we planned to start our hike. I was feeling pretty tired right from the start but figured with some time I would get into the swing of things but I failed to eat well the night before and without a good breakfast in the morning I was already starting the day at a bit of a disadvantage. After this hike I can say that a good night’s sleep and proper nutrition are keys to success when it comes to long days like this. We hit the trail at about 5:30am which was a little later than we intended but being that the days are so long this time of year it was already bright when we started. The main challenge early on in the hike was that there is a large web of trails that extend out from the Appalachia Trailhead so we had to keep checking our map to try and stay on route. We didn’t really plan this part of our hike too well so we really just winged it for the most part. 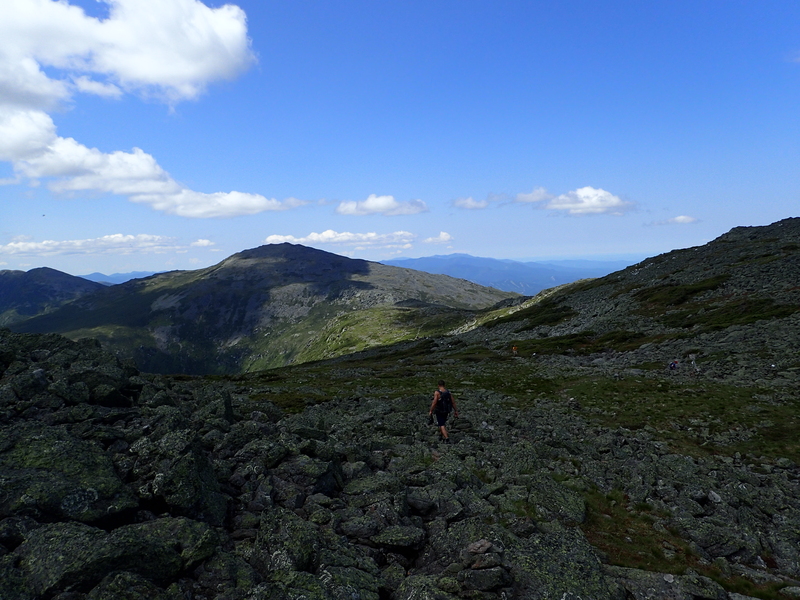 We started by heading up the Valley Way trail before splitting off near the top to head up directly towards the summit of Mount Madison. The trail was pretty steep from the get go as it followed its way along the side of a large brook. It was really a beautiful trail and ended up being the only time I would spend in the trees the whole day. The trail eventually crossed over the brook at a nice waterfall before cutting steeply up the side of the mountain forcing us to climb up and over rocks and roots to make any progress. 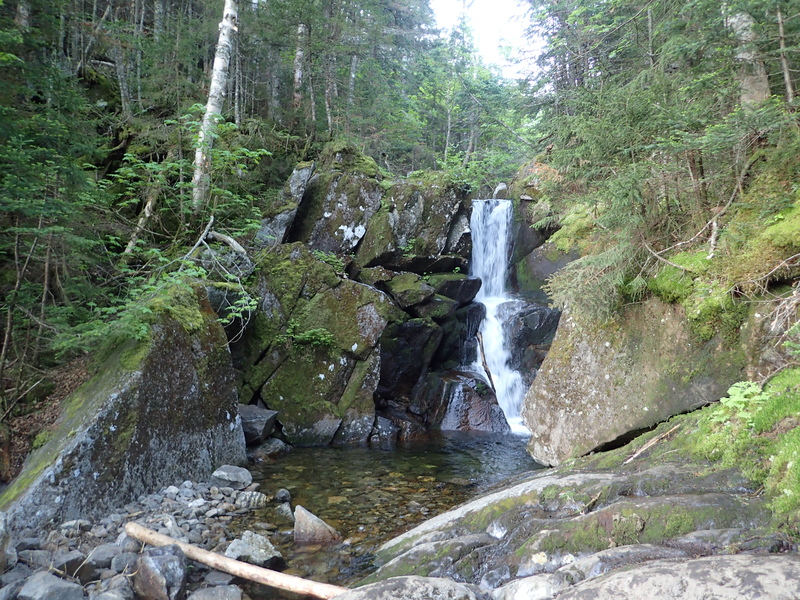 View of the small waterfall we passed in front of as we headed up towards Mount Madison from the Appalachia trailhead. Despite the steep and rocky terrain we made pretty good time and at this point all was well. It really didn’t take too long before we reached the edge of the treeline and began to get our first glimpse of the ridgeline we would be traversing. First view we had through the trees. First view of the ridgeline ahead of us. Once we got above the trees heaps of talus were the name of the game for us. 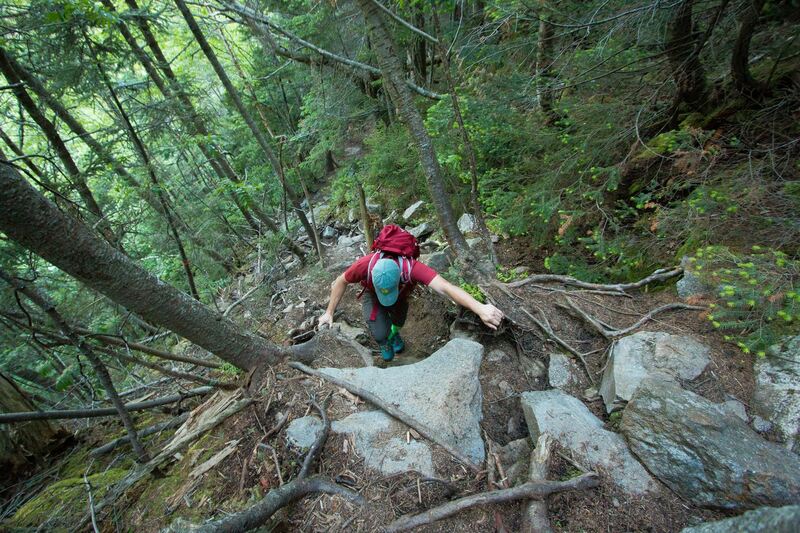 There wasn’t a trail so much as there was a rough path through the talus which littered the mountain. The rockiness of the terrain made it hard to move quickly and also did a good job of aggravating an old knee injury that picked the worst time to rear its head. Stav taking in the view as we reached the treeline. 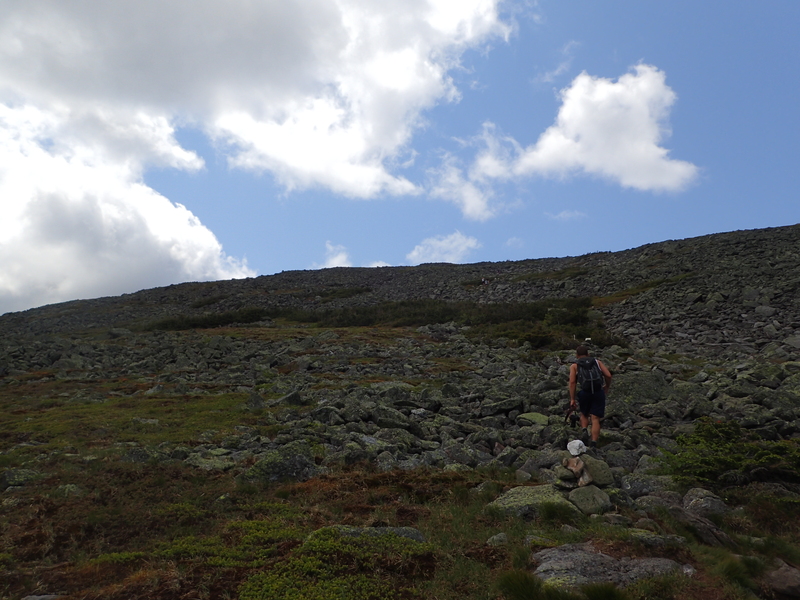 At this point the grade wasn’t too steep and we made steady progress up the gentle flank of Mount Madison. 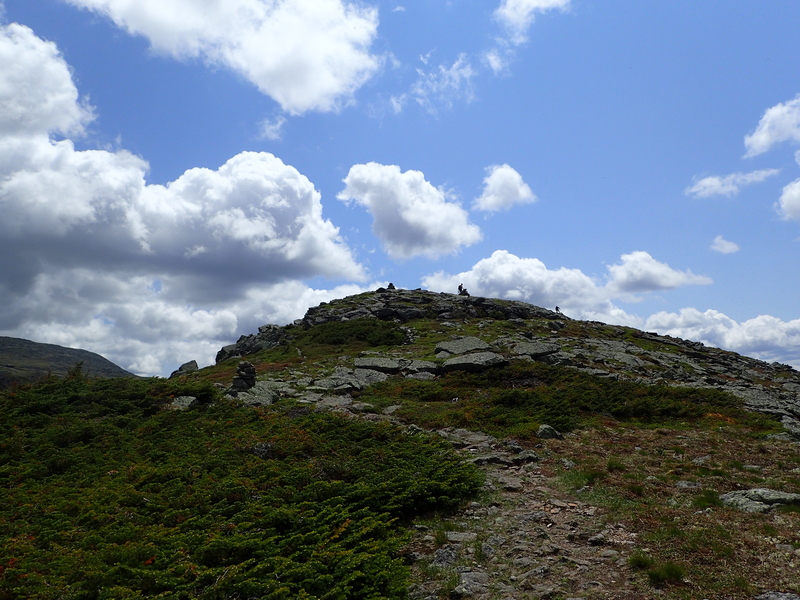 Looking up towards the summit of Mount Madison. 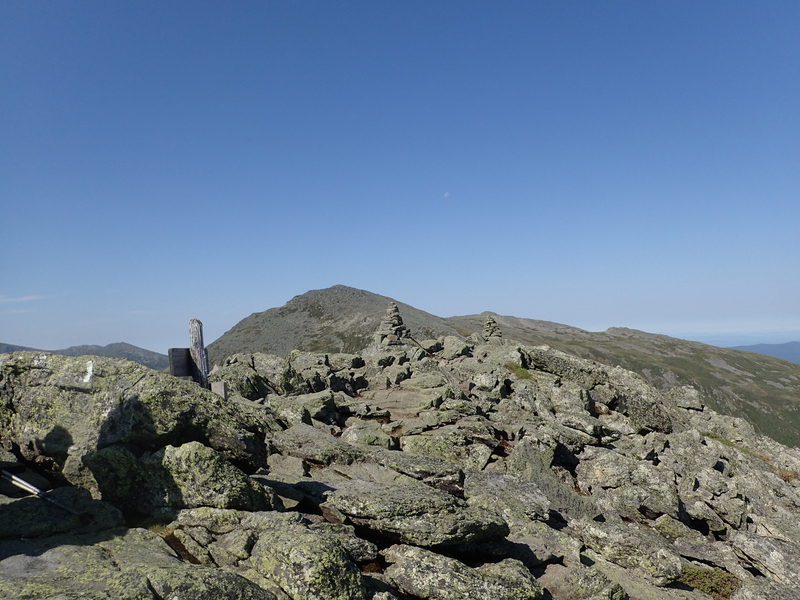 Before too long we reached the summit of Mount Madison and took a few minutes to have a snack and take in the views. The Presidential Range is a unique and beautiful place and this vantage only made the hike we were on seem all the more massive and impressive. 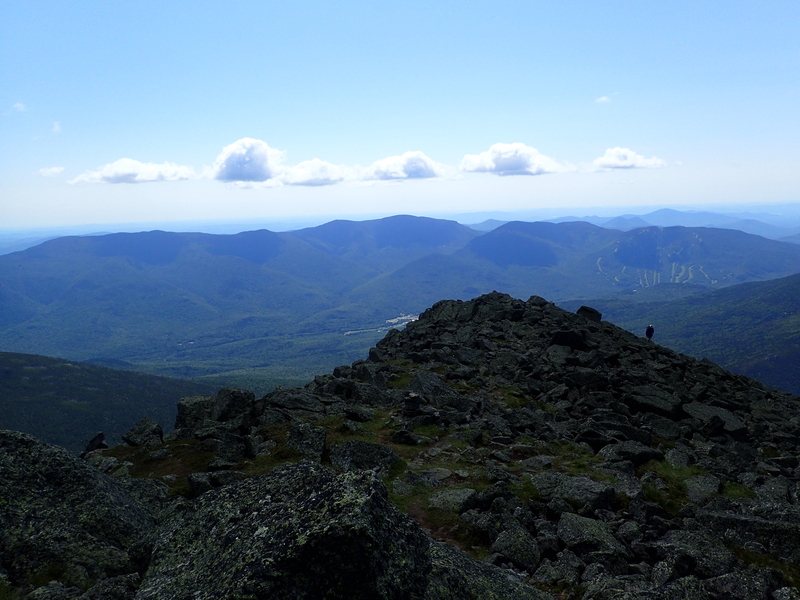 Although it is less than 6 miles away, Mount Washington looms in the distance and seems impossibly far away. 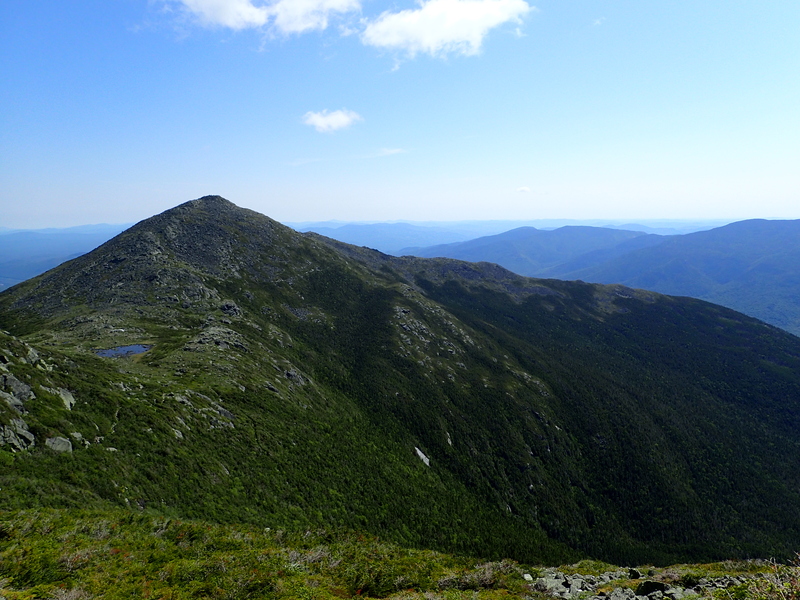 View of Mount Washington in the distance from Mount Madison. Given that we had a long day ahead of us we didn’t linger too long on the summit. At this point I was still feeling pretty good so we kept on trucking towards the Madison Spring Hut. I should add here that the hut system in the White Mountains is pretty top notch and I would love a chance to stay in one at some point in the future. Also as a side note they make really great cookies! After a quick pit stop at the hut to use the facilities we started to make our way up Mount Adams. From this point we actually had two options on how to get up Adams but we ultimately settled on what I believe is the harder variation which is to go up the Star Lake Trail. Looking towards the Star Lake trail which winds its way up the cliff side just past the first bend you see in the photo. Star Lake is not a huge lake but it really is situated in a beautiful spot on the ridge and is probably the most picturesque mountain top lake I have seen this side of the Rockies. We stopped here again to snap a bunch of photos before continuing on our way up Mount Adams. Looking back over Star Lake towards Mount Madison. At this point the trail began to get much steeper as it made its way over more talus and a short cliff section on the trail towards Mount Adams. At this point my knee started to act up a bit and I could tell that it may become a problem as the day wore on. Despite the technical difficulties we made good work up the trail. Looking up the steepest section of the Star Lake trail. The hike from start to finish was incredibly picturesque and I really don’t think the pictures do it any justice. Even if you only have the time or energy to hike one of these peaks at a time you owe it to yourself to do them just to take in these magnificent views. Looking back down at Star Lake and Mount Madison beyond. The final approach up Mount Adams consisted of large talus and boulders and nothing that really resembles any kind of “trail”, however finding the way was easy and we were able to make good time up and over the obstacles. 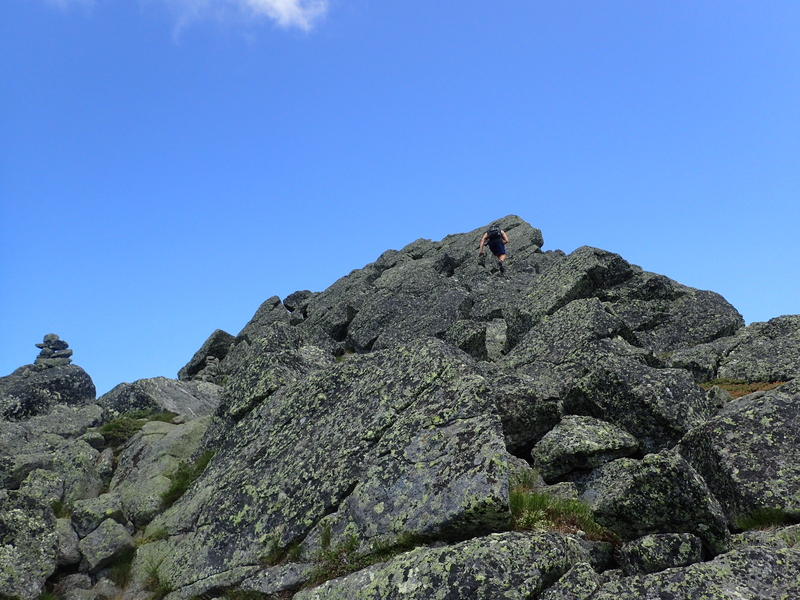 Final approach to the rocky summit of Mount Adams. Once on top of Mount Adams we were greeted by some of the best views of the day. I should also note that this is by far the best weather I have ever had in the White Mountains and I made sure to cherish each and every second. 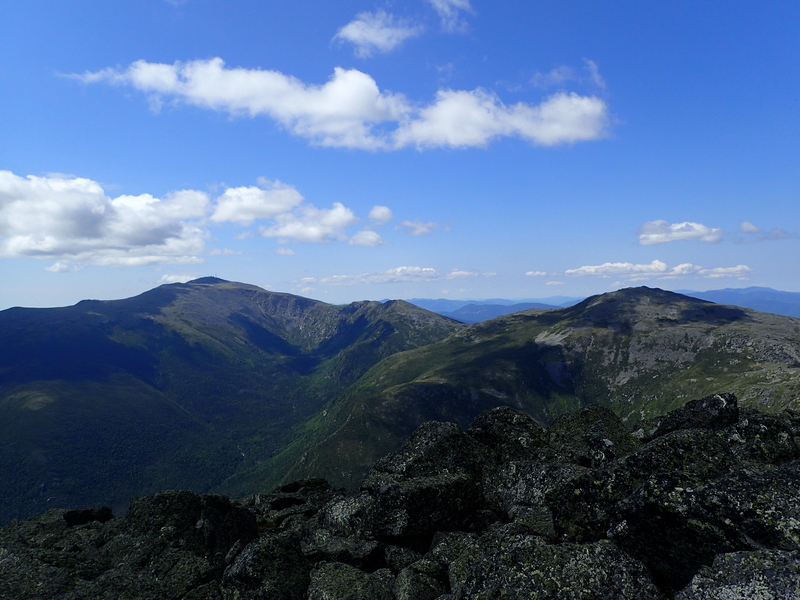 Looking out towards Mount Jefferson, Clay, and Washington from the summit of Mount Adams. Looking back at the final approach to the summit from the Star Lake Trail. Looking back towards Mount Madison and all the terrain we had covered up to this point. At this point it was starting to get a bit later than we anticipated being at this point so we didn’t stop on the summit and simply kept on trucking towards Mount Jefferson. The trail between this point and Mount Jefferson was exceptionally rocky as well but luckily the worst of it was downhill so my knee was able to get a little bit of a break. Strangely enough this particular injury really only hurts climb up the talus and not going down it but I’m not really complaining! 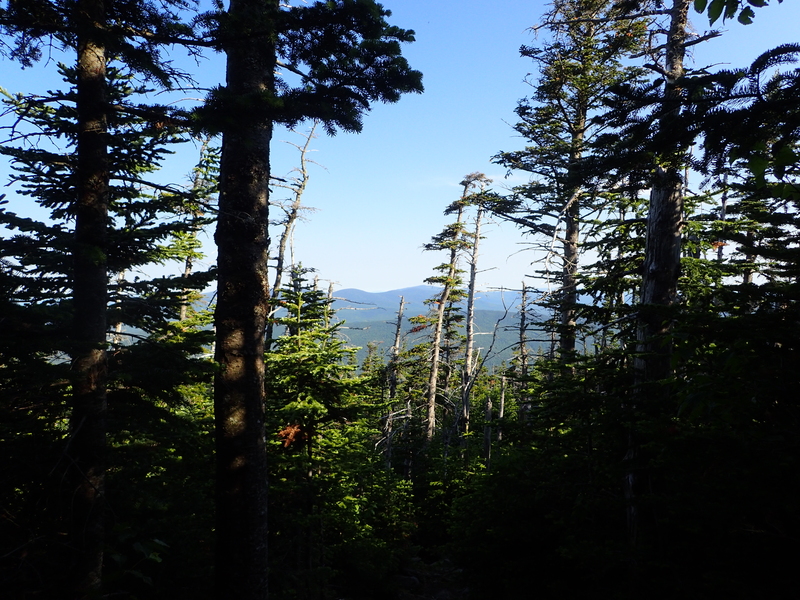 Looking out towards Mount Jefferson on the descent from Mount Adams. Another clearer view of Mount Jefferson in the distance. At this point I was definitely losing some steam but I still felt well enough to continue so I pressed on towards the summit of Mount Jefferson. As we neared the base of the mountain there was an option to bypass the summit but I figured I had already come this far so I would top out on it and than reassess what I wanted to do with the rest of the day. 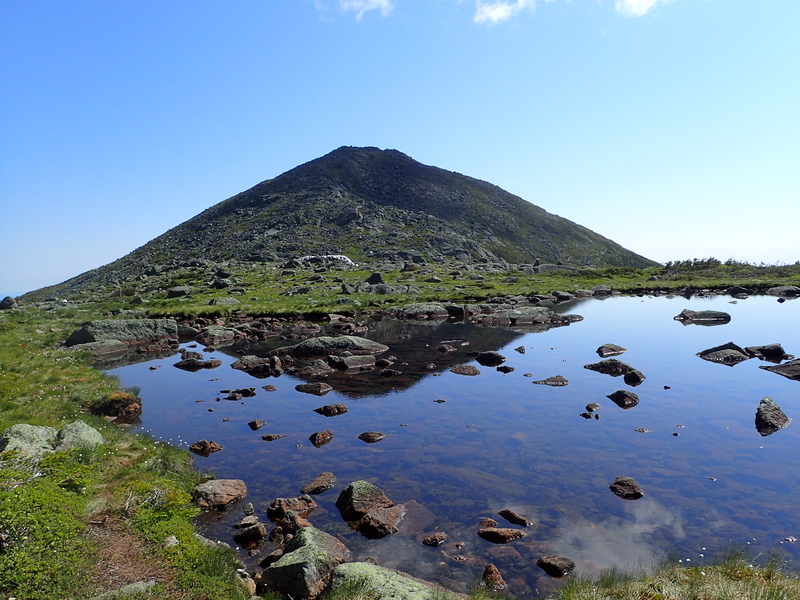 The final approach to the summit on the Mount Jefferson summit loop trail was not too bad but in my state at the time I was definitely starting to move slower than I would have liked. 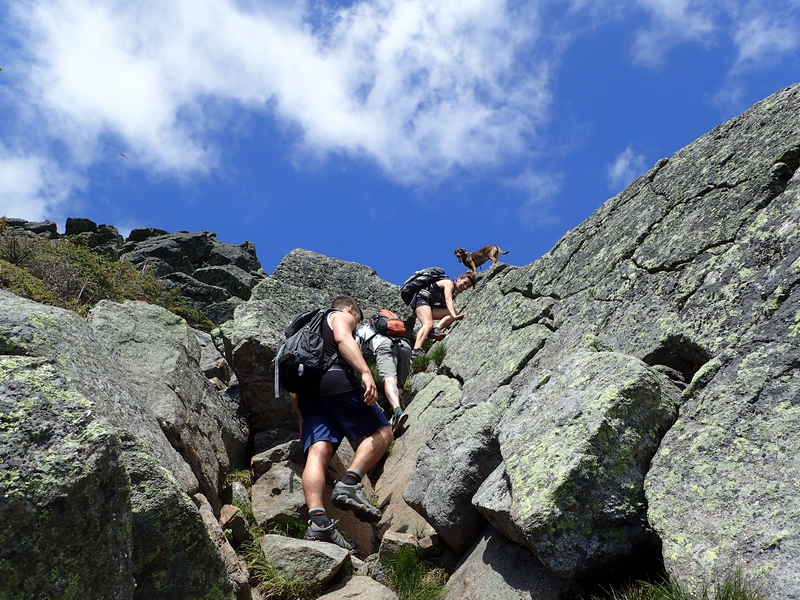 Working our way up towards the summit of Mount Jefferson. We topped out on the rocky summit of Mount Jefferson before too long and sat down for a bit of a break. I also took some time to look at the trail map and figure out what my bail options might look like. I knew that I was moving much too slow to finish the traverse in any kind of reasonable timeframe and I didn’t want to hold up Stav anymore than necessary. My knee was aching and a general malaise was starting to set in. 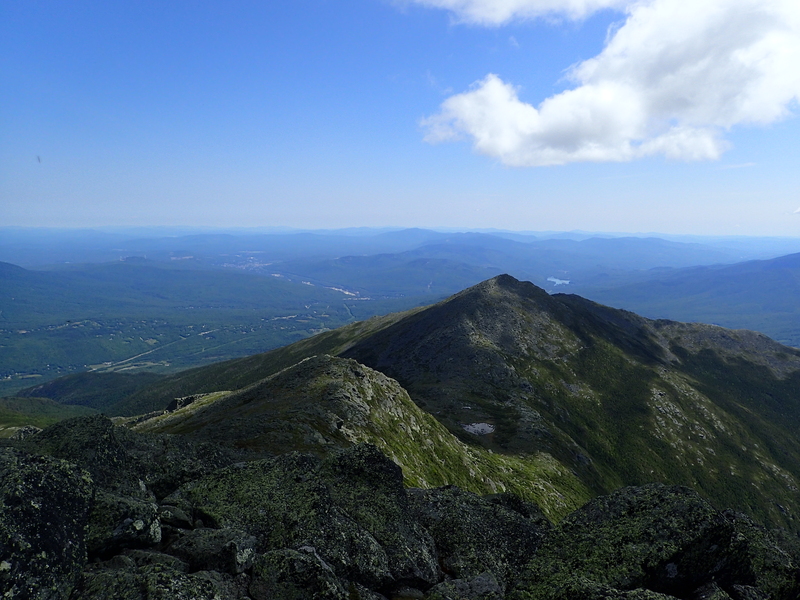 In my personal experience it can be hard to snap yourself out of these feelings once they start to take hold but I eventually decided to carry on to Mount Washington and just reassess the situation at that point. Once we got off Mount Jefferson the talus trail eased up substantially but there was still plenty of rocky trail left to cover before reaching the truly easier ground on the opposite side of Mount Washington. Looking out towards Mount Clay and Washington. I had another choice of whether or not to bypass Mount Clay but decided again that I would rather go up and over than go around. It made for a harder hike but I was reluctant to let go of my original plan despite the state of disrepair my body was in. 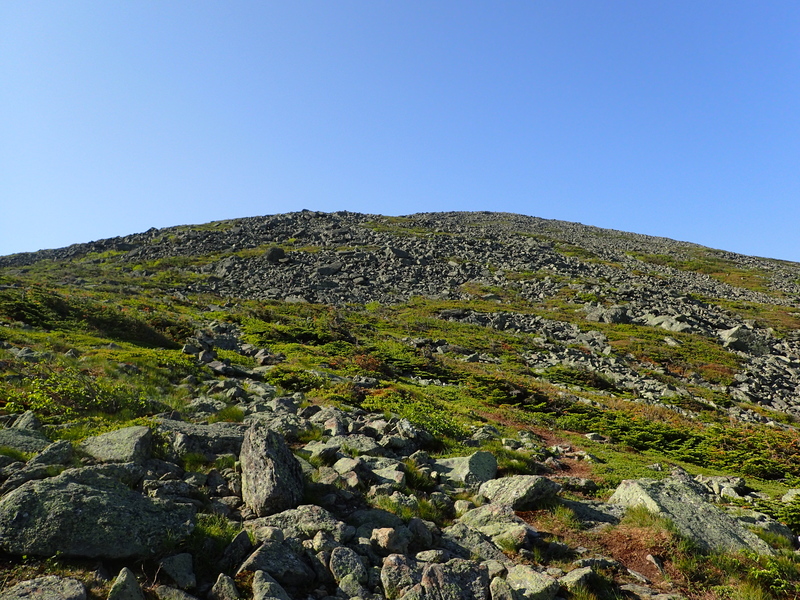 Looking up towards the summit of Mount Clay. Mount Clay is really a pretty big tease because every time you thought you were at the top you would crest the ridge and one more hump would await you. However, the views were still just as beautiful as they had been throughout the day so it was hard to be too disappointed by the end. 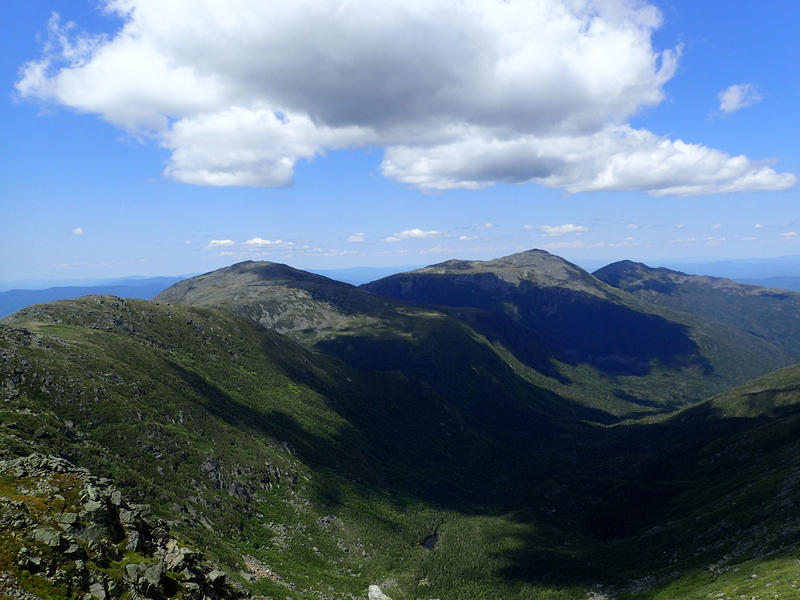 View of Mount Washington from the shoulder of Mount Clay. 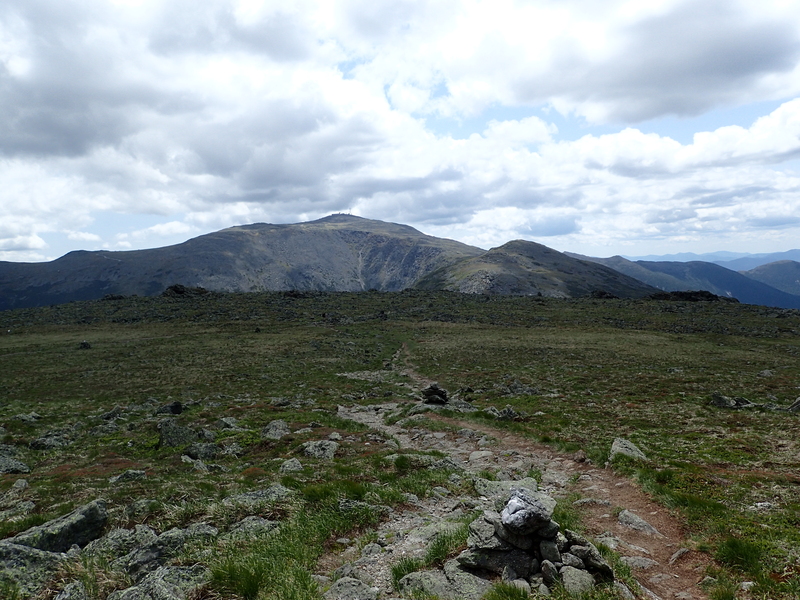 Since time was still pressing we didn’t stop on the summit of Mount Clay and instead kept moving up towards Washington. By this point in the day the trail was also becoming quite busy with people but it didn’t really detract from the overall experience. 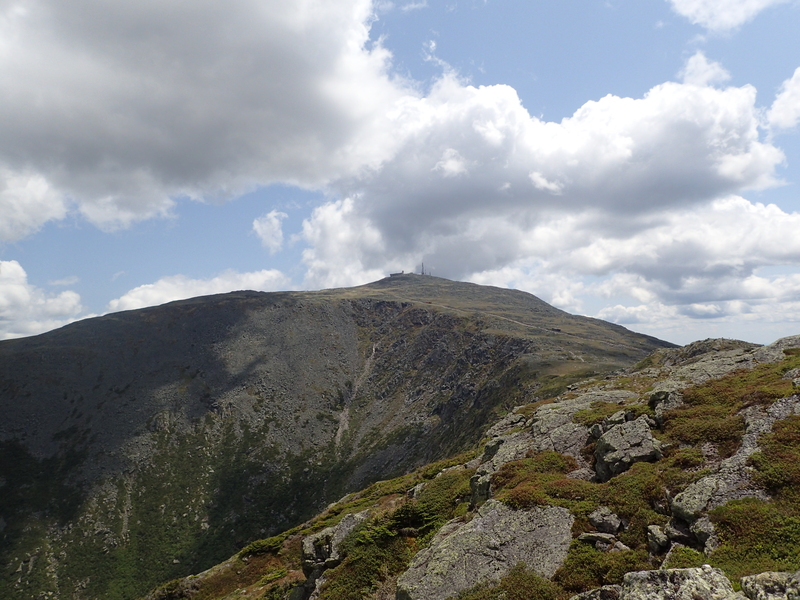 Looking back towards Mount Clay from the flank of Mount Washington. The hike at this point eases up a little bit in that the trail becomes a bit less rocky but at the same time the grade heading up the side of Washington was still very steady and taxing. The sun was also in full force and the heat was starting to take its toll. 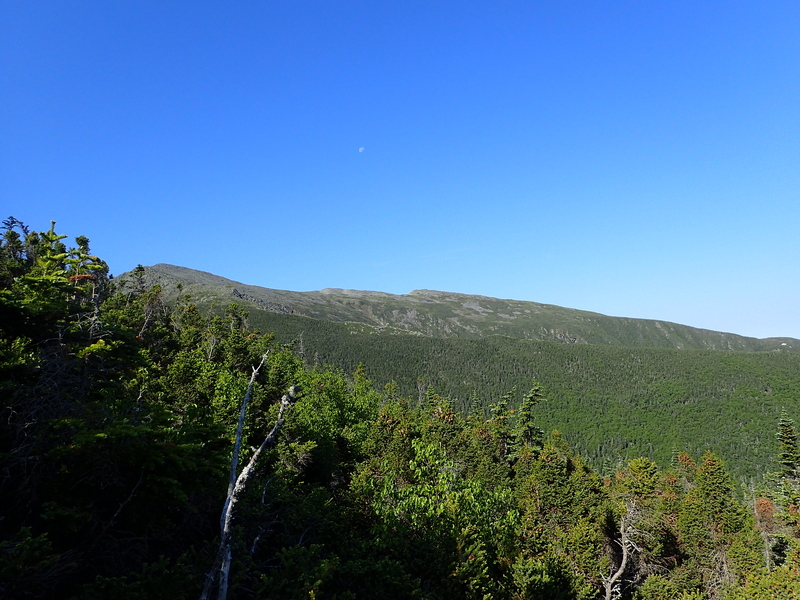 However, once we were making our way up the side of Mount Washington we had excellent views of the entire northern part of the range we had just hiked. Unfortunately at this point I had also completely run out of water and was becoming increasingly thirsty. Looking back at everything we had just hiked over. As we made our way up the final talus slope to the summit the structures on the top of Washington were teasingly close. There were also a ton of people coming up and down the trail at this point. 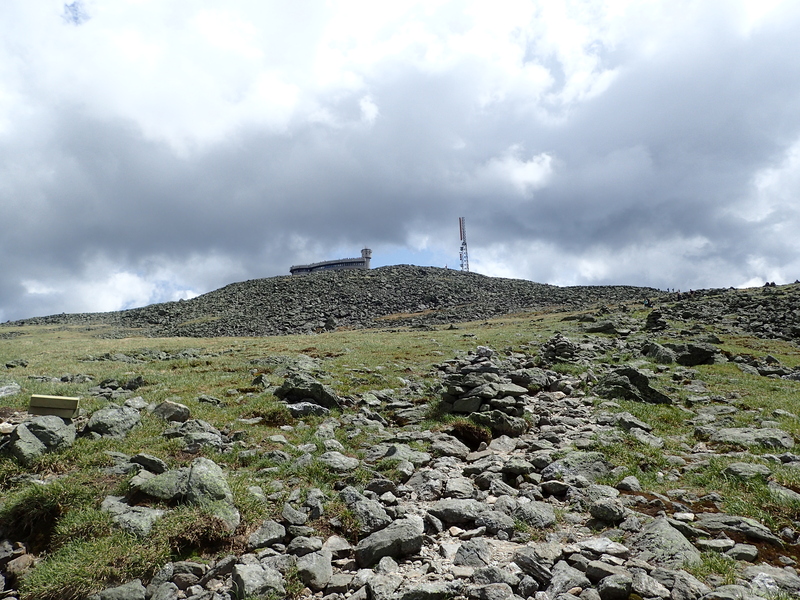 Before too long I reached the Cog Railway line which you have to hike up and over to continue on your way towards the summit. 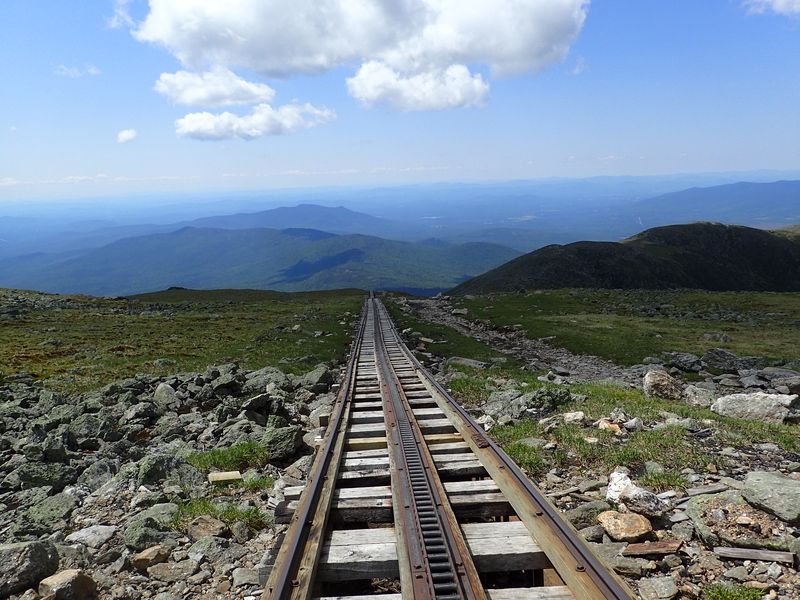 Looking down the Cog Railway. At this point in the hike I had totally bonked and I knew there was no way I was going to be finishing the entire traverse. 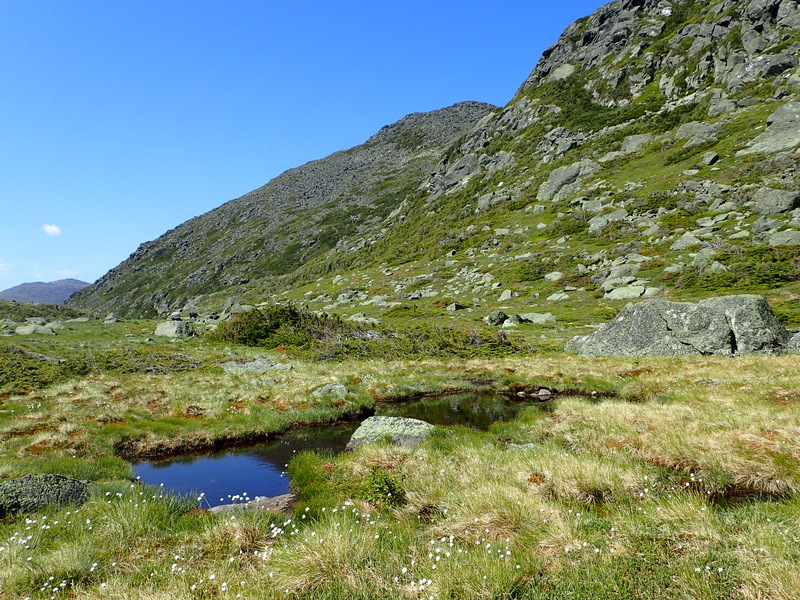 The last quarter mile stretch to the summit seemed to take forever and all I could think about was getting an ice cold drink. 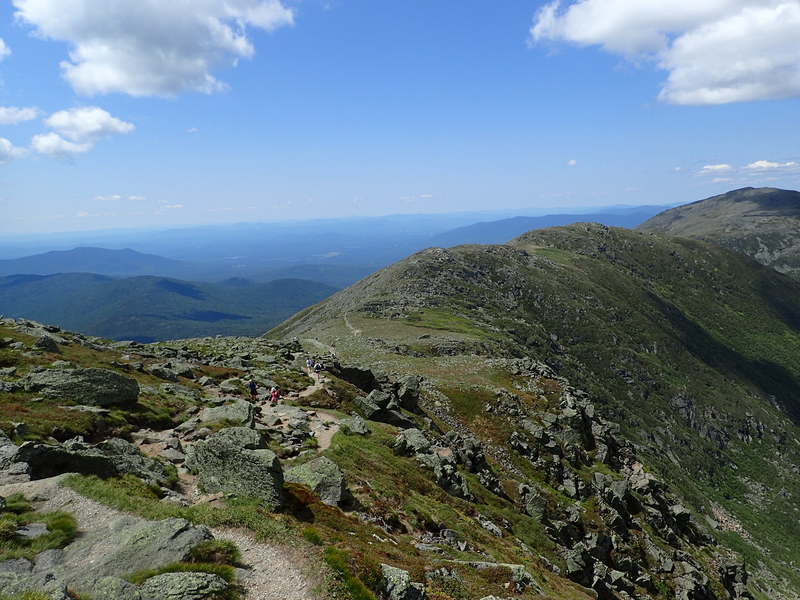 The last stretch towards the summit of Mount Washington. 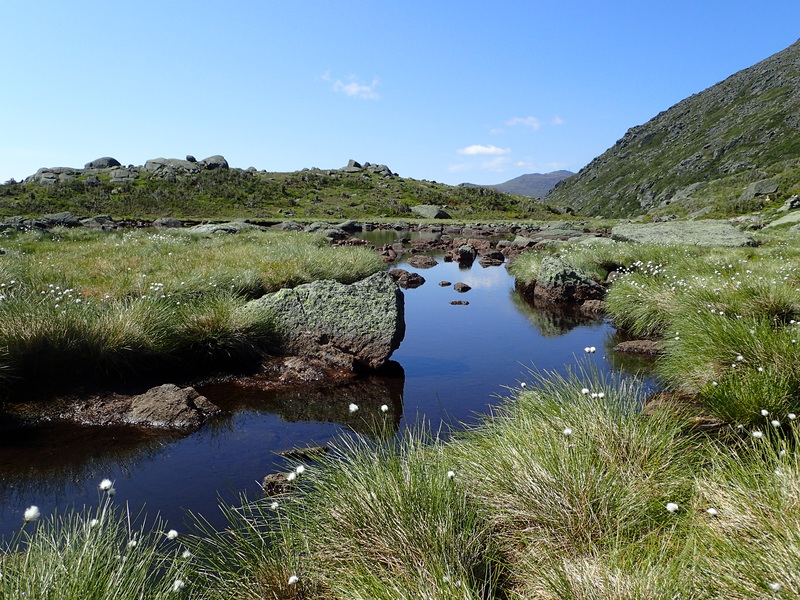 Once I reached the summit I was greeted by a chorus of voices and activity all around me which was a stark change from the solitude of the early morning hiking. People were everywhere and the summit sign had a line of people waiting to take their picture. 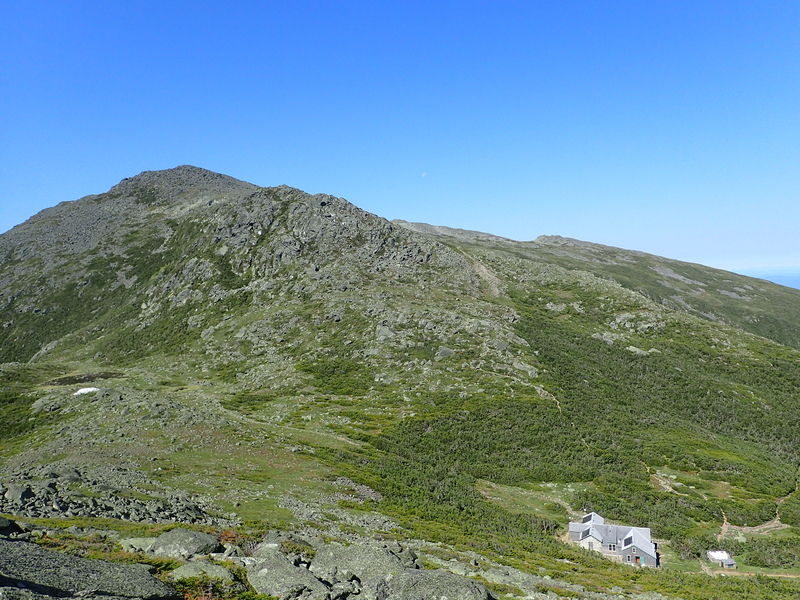 I have summited Mount Washington three times previously including winter so I didn’t have any interest in dealing with any of that. 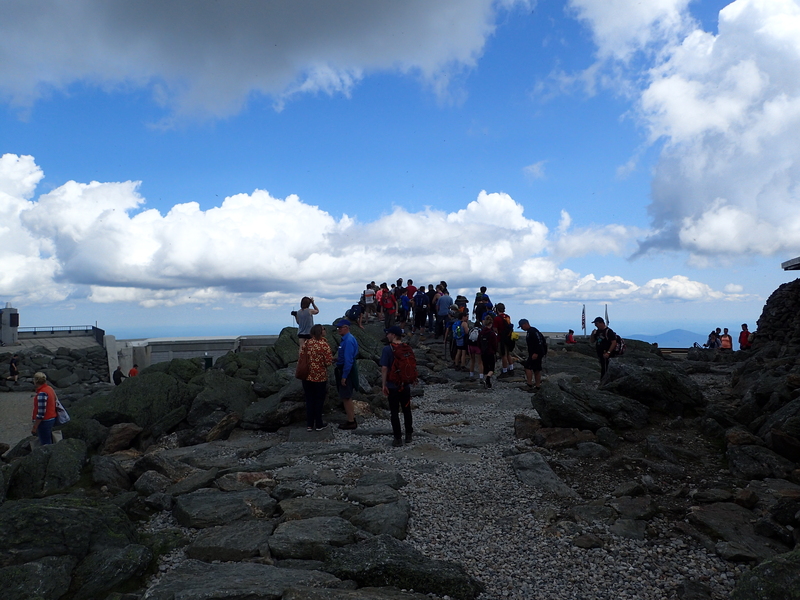 Line of people waiting to take a picture with the summit sign. Once I reached the summit a little before 3pm, I met back up with Stav and let him know that I was done and I would find a way back down the mountain from here one way or another. 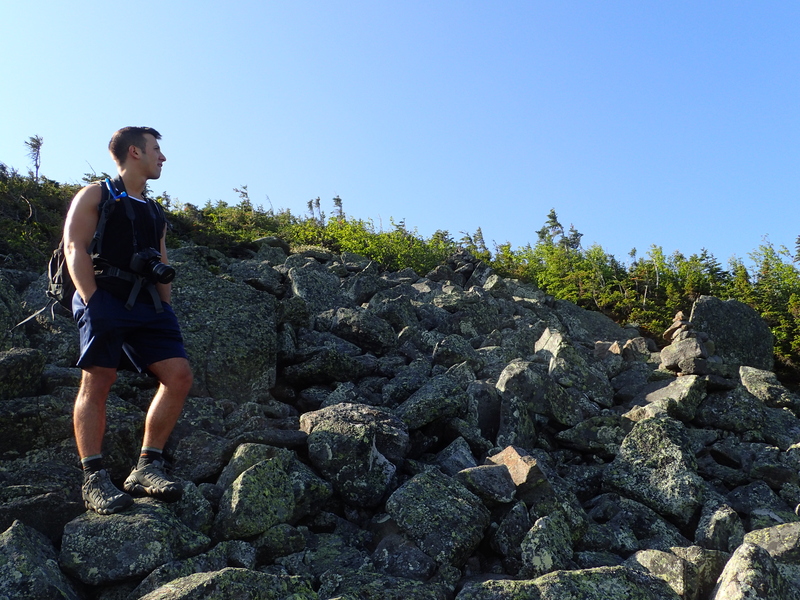 I urged him to press on without me and complete the last 11 miles of the traverse, which he ultimately did. In the end I was able to get a ticket for a shuttle down the auto road and from the Pinkham Notch Visitor Center was able to hitch a ride back to my car at the Appalachia Trailhead so I could start the 6 hour drive back to New Jersey. 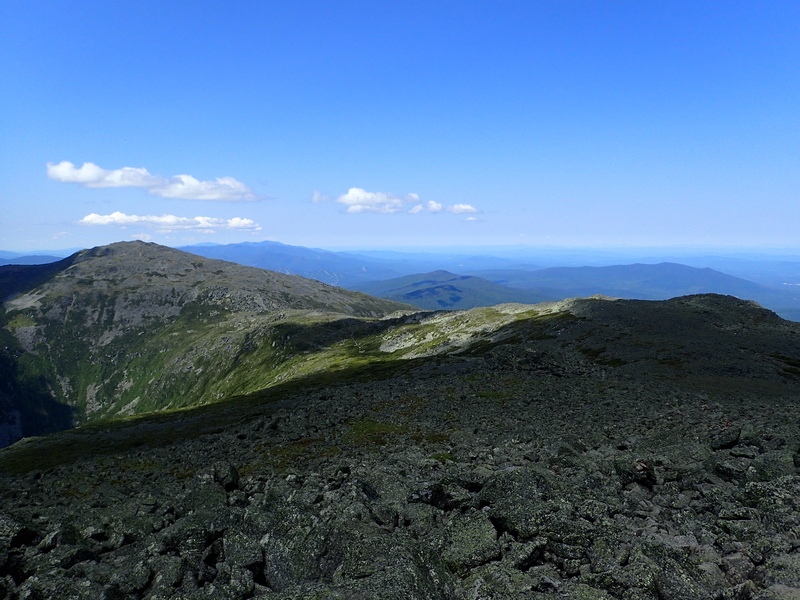 The Presidential Range is a truly magnificent place and the full traverse is a great challenge and that I will be back to complete as soon as I can. Ultimately I am more disappointed in myself than anything that I was not able to complete the entire hike but sometimes that is just the way it goes. I had a bad day for various reasons and that is just the way it goes sometimes. It never feels good to leave work undone but the mountains will still be there and I feel that I made the conservative and responsible choice in calling it a day when I did. It was still an incredible day in the mountains and it has just made me more excited to go back. You got such a beautiful day! I went last year and it down poured my entire visit. It was by far the best day I have had up that way. Of my 3 other days on Mt Washington 2 of them down poured and one of them had sustained 60+ mile per hour winds with temperatures well below zero in February. Its always an adventure in the Whites.